In this short interview, we see how Billy Graham, approaching retirement from an active religious career, contradicts the Bible and his Southern Baptist doctrines. Like an unmoored ship, his carnal mind casts about in the sea of his imagination, filling in the blanks of what he never had in the first place – a true relationship and understanding in Christ. “And He said to them, So it is written, and so it behooved Christ to suffer and to rise from the dead the third day, and that repentance and remission of sins should be proclaimed in His Name among all nations, beginning at Jerusalem” (Luke 24:46-47 MKJV). 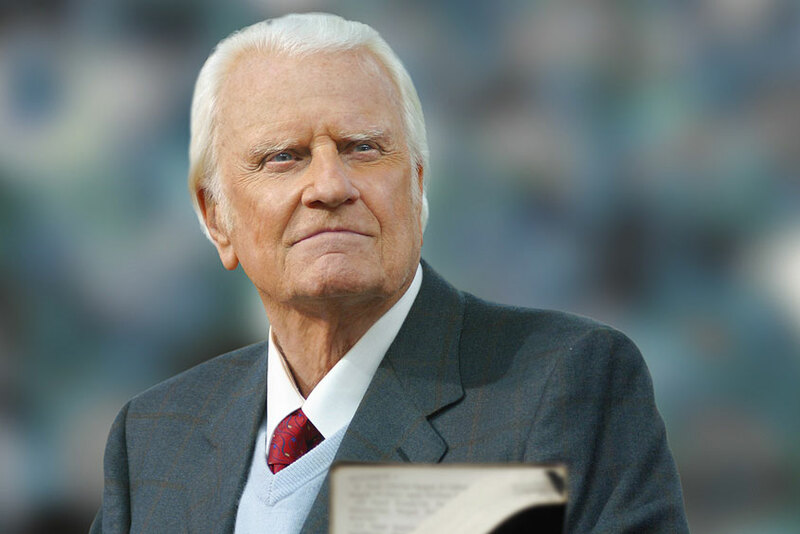 In 1997 Billy Graham was interviewed by Robert Schuller on The Hour of Power, making some incoherent and startling statements of unbelief, even denying the Lord Jesus Christ. This was no surprise to us, having known for many years that Billy Graham never knew the Lord, as He revealed to Victor. Furthermore, Victor had prophesied this very thing would happen. In his old age, it was said, Graham would openly admit he didn’t know the Lord and wasn’t certain of what he had previously preached. That’s exactly what you’ll see in the transcript below. Graham: Well, Christianity and being a true believer–you know, I think there’s the Body of Christ, which comes from all the Christian groups around the world, or outside the Christian groups. I think everybody that loves Christ, or knows Christ, whether they’re conscious of it or not, they’re members of the Body of Christ. And I don’t think that we’re going to see a great sweeping revival, that will turn the whole world to Christ at any time. I think James answered that, the Apostle James in the first council in Jerusalem, when he said that God’s purpose for this age is to call out a people for His name. And that’s what God is doing today; He’s calling people out of the world for His name, whether they come from the Muslim world, or the Buddhist world, or the Christian world, or the non-believing world, they are members of the Body of Christ because they’ve been called by God. They may not even know the name of Jesus, but they know in their heart that they need something that they don’t have, and they turn to the only light that they have, and I think that they are saved, and that they’re going to be with us in heaven. Schuller: What, what I hear you saying is that it’s possible for Jesus Christ to come into human hearts and soul and life, even if they’ve been born in darkness and have never had exposure to the Bible. Is that a correct interpretation of what you’re saying? Schuller’s face beams as he says: This is fantastic! I’m so thrilled to hear you say this. There’s a wideness in God’s mercy. (10) Be it known to you all, and to all the people of Israel, that by the Name of Jesus Christ of Nazareth, Whom you crucified, Whom God raised from the dead, in this Name does this man stand before you whole. (11) This is the Stone which you builders have counted worthless, and He has become the Head of the Corner. (12) And there is salvation in no other One; for there is no other Name under Heaven given among men by which we must be saved. When God calls a people out for His Name, won’t they know His Name? And knowing His Name is much more than recognizing a physical name and historical person. They will know Who God is because they have met Him in Jesus Christ, by His Spirit. “He who has seen Me has seen the Father” (John 14:9). (14) “If you ask anything in My Name, I will do it. (15) If you love Me, keep My commandments. (17) the Spirit of Truth, Whom the world cannot receive because it does not see Him nor know Him. But you know Him, for He dwells with you and shall be in you. (18) I will not leave you orphans. I will come to you. (19) Yet a little while and the world does not see Me any more. But you see Me. Because I live, you shall live also. (20) At that day you shall know that I am in My Father, and you in Me, and I in you. So if the living God, the Lord Jesus Christ, comes to make His abode in you, how can Graham say you could know Him without knowing His Name or Who He is? After marrying a woman, would a man not know her name or know who she is? How much greater the impact of an intimate relationship with the living God? What Graham’s sayings reveal is that he has never met the Lord or had this intimate relationship with Him. Graham doesn’t “know His Name,” which is to know His true Essence and Being. He’s never been saved. Billy had been reciting the teachings of men and his carnal, memorized knowledge of the Bible all those many years in his “crusades.” Now he contradicts many of the things he previously quoted from the Bible, showing he didn’t comprehend or have the substance of those sayings. He never knew God and openly confesses so, though without confessing his culpability or presumptuousness in still being received as an expert. Instead of admitting he’s been a fraud, he comes across as humble and loving, a benign, if slightly senile, old uncle. Yet he is still peddling no less a toxic poison as the false gospel he preached before (which he still does, though altered), because all lies kill. (13) For it is not the hearers of the Law who are just before God, but the doers of the Law will be justified. “…in a day when God shall judge the secrets of men by Jesus Christ according to my Gospel” (Romans 2:16 MKJV). In other words, these things will serve in the day when the people are judged by Jesus Christ. His judgment will bring them the knowledge of God, and they will come to know Him. Graham will also be judged, but those who make themselves first shall be last. Graham sees friendly, smiling faces and professions of belief in God and thinks, “Who can say these people don’t really believe?” After all, that’s what he does – plays the part and thinks it should pass for what’s real. He has no discernment or wisdom, because the Lord isn’t with him, because he isn’t with the Lord. Graham has what he’s after – the praise of men. Billy Graham, in the most attractive and “pious” of ways, is a butcher of millions of souls. He is a star pupil of Nimrod, the mighty hunter of souls before God. He has killed millions in the Name of Christ. The Lord exposes him to deliver the sincere seeker from the snare of the fowler. Raymond says to us, “Shame, shame, shame,” after reading “How the Lord Exposed Billy Graham.” He praises Graham as full of love, but can he disprove what the Lord has shown us? There is a difference between man’s virtue and God’s virtue. This most pernicious lie of Billy Graham’s gospel, causing untold misery by its deception, is thoroughly debunked by God’s own words. William argues in defence of “Doctor” Graham, appealing to the accreditation of men and denying the present judgment of God. We show the fallacy of both notions, and how his arguments prove that his own conversion, like all of Graham’s, is false. When William hears we had hoped he would believe, confess his wrongness, and turn from his sins, he acts incredulous and states that we are the ones who sinned by publically “defaming” Billy Graham. If we want to debate, he says, we should debate the man who says Adolph Hitler will be saved. You need to hear Victor’s answer. A Liberty University professor of Christ protests our listing of Billy Graham’s denial of the gifts of the Spirit as the mark of a false teacher. He says this is not a salvation issue. We show him that one cannot be saved except one is baptized with the Spirit, which is Christ’s power for a new life. “Dr.” Rima says we make him sick with our “divisive” writing about Billy Graham. But didn’t Jesus say He came to divide? Yes, included would be the division of His sheep from doctors of theology and their ilk. A defender of Billy Graham, who claims to be filled with the Spirit of God and flowing in His gifts, appeals to us to cease judging in the name of love. We identify the treacherous nature of his love and the false spirit behind it. Thus the stronghold of false Christianity falls before the Son of God.